In the Night Garden Live completed its 2015 UK tour in Glasgow’s Queen’s Park earlier today, bringing to a close its sixth year of delighting audiences young and old. Housed in a totally unique portable theatre, designed and built by Tectoniks, the show has now played to an astonishing half a million people in cities around the UK. 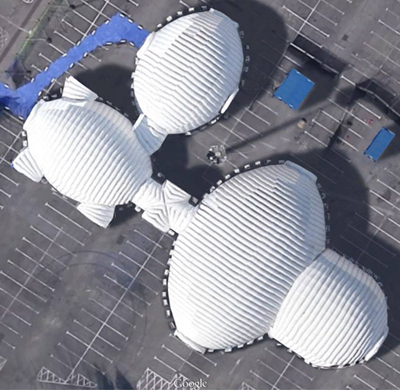 In its original configuration the theatre was made up of four inflatable structures - an entrance lobby, an auditorium, a backstage area and a link tunnel which measure over 66 metres (216 feet) long by 37 metres (121 feet) wide when assembled. The inflatable entrance lobby provided room for merchandising, a food and drink area and toilets (including baby changing facilities). Being of a modular design, the structures can be installed in various configurations to suit the available space at each venue on the tour. Following the phenomenal success of the show’s first tour back in 2010, an additional structure was added in 2011 to provide increased space for merchandising and activities such as ‘meet a character’. In such a demanding environment the longevity of the structure is a testament to the robustness of its materials and the quality of its design and manufacture.